Third day of our adventure was spent on board St. Michael the Archangel ship of 2GO Travel on our way back to Manila. It took us around 8 hours to travel from Bacolod to Manila. I dedicate Part 3 of my Cruisin to Iloilo and Bacolod mostly to the people I met at 2GO Travel. Sir Chef, who was responsible why we all gained a few weights after the trip, performed a cooking demo cooking some kind of fish in vinegar, and some kind of dessert using bread crumbs. SActually he showed us how to impress the ladies using a wine glass. We also had two guest bloggers that shared with us their experiences with 2GO Travel and learned a few tips from them on how to enhance our blogs. Awarding of Certificates of Cruisin' for everyone, plus the special awards given to those that made their posts on Facebook, Twitter and Instagram more creative and viral. Due to the lack of a stable Internet connection, I was not able to participate actively. I was also in awe when I found out one of the bloggers was able to tweet more than a hundred times on Twitter within those three days! Wow! One made an impact on Instagram with so many Likes and shares. However, the Facebook challenge announcement of winner was postponed due to intermittent Internet connection. Echo shared a lot of worthy topics that will be very useful for us. It is admirable that he has traveled to a lot of places already at a very young age, and that he is using his video blogging as a way to express himself. Anthony was also a creative one as he uses his animation skills to come up with fascinating creations that are truly eye-catching for both kids and the young at heart. 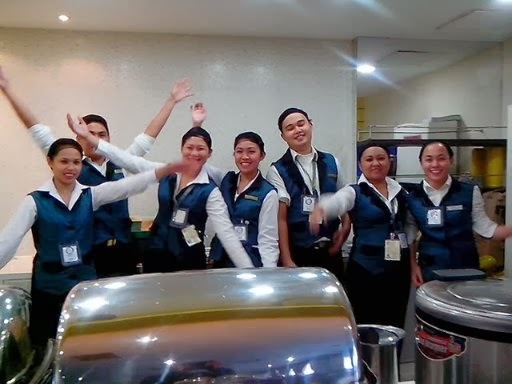 The rest of our free time I tried to spend wisely by going around the ship and checking up on some of the details of the facilities and also took time to mingle with the passengers and crew, interviewed them and asked them to do a video greeting for Wazzup Pilipinas! It was my opportunity to get to know more about 2Go Travel services and the passengers - the people who trusted them for their trips to their respective destinations. After a few minutes at the viewing deck breathing the morning winds, looking at the sunrise, and feeling its warmth against my skin, I started my day interviewing a few passengers. I approached a mother and daughter having their breakfast. I was fortunate that they agreed to the interview and I could sense tat they are satisfied with the service they got from 2GO Travel. "Thank you for allowing me to interrupt your breakfast and sharing your insights about your experience at 2Go Travel. Yeah, I agree when you said its quite cold in the ship"
These group of teenagers also caught my attention. Lately during the interview, I found out that they are students undergoing training on the ship. They also voluntarily offered to sing for me. Wow! Bonus performance from a surprisingly great choir. "You guys really sing with your heart and soul. I am fortunate meeting you all. I knew there was something special within you all." Thank you also to the lovely ladies on the lobby counter. Theirs are the voices we hear sharing announcements to the passengers, in English and Tagalog. "Thank you to Miss Goldbilyn Mondaya and Miss Regina Grace Manio for giving us your own Taglog and English translations of a 2GO Travel greeting." 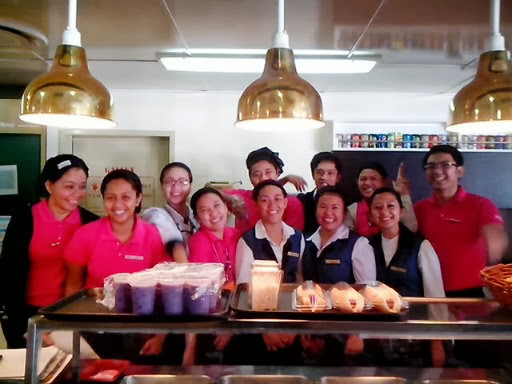 Thank you also to Mr. Julius Quezon for taking care of our basic services throughout our entire three days of stay aboard the St. Michael the Archangel ship. "Thank you for taking me on the bridge to meet Captain Ariel and my room mates also thank you for their toiletries. They apologize that one of them had to flush the toilet due to some uncontrollable call of nature." The three make an impressive Wazzup Pilipinas greeting! Thanks a bunch, guys!!! I hope all of you graduate with flying colors - along with the color Magenta!!! 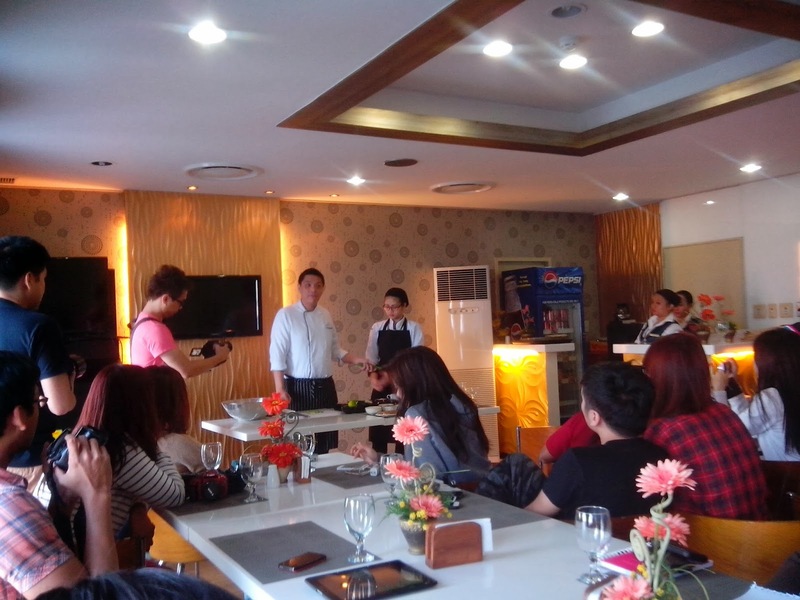 Thank you to Sir Chef for our special menu for three days, and for the cooking demonstration. Thank you to the adorable ladies who cut my hair and massaged my back! More manpower please so we don't have to wait so long. Imagine waiting in line after somebody who is having a hair rebonding treatment. Lol! Of course, thank you to the Captain and his mates for bringing us safely from Manila to Iloilo, and then Bacolod to Manila, safe and sound. It's the first time that I've learned that a captain has a first mate, a second mate and a third mate. We're really in good hands - plenty of them!!! Thank you, Captain Ariel! Hope to see you again when I come back for my second trip!" I didn't get sea-sick at all! This means I can tolerate the roughness of traveling by sea. This means this will not be the last time I travel by ship. I guess it was a unique experience that is best spent with your friends or "barkada". You'll have plenty of time to bond and hang out with each other. Share more wacky stories and corny yet laughable jokes. More time spent with each other means more time to get to know the real character of your friends. You will know for sure who loves to eat, lie down in bed all day, takes all day inside the toilet, snores or talks in his sleep, and who drinks the most beer but never gets drunk....only to find out she has spent the rest of the night at the dining area. Yeah! It's fun spending quality time aboard a ship....especially if its with 2Go Travel! and if it the stories are being told by.......Wazzup Pilipinas! It was nice that the author was able to have time to write an article about the passengers instead on concentrating only on the places they visited. The article shows that Filipinos are hospitable people. He also acknowledge their efforts in making the trip unforgettable. He posted pictures and videos of the people who were able to showcase their talents. The Joy is in the Journey. For every traveler who travels and often set there mind to what is in their destination, the excitement and aura is really less than those who start their journey, in the journey. Often those who admire the means of transport and the events that occur during their travel is more overwhelmed than those who just travel for the destination. And the people behind this wonderful article were no less than the most successful traveler of all. The author's experience in 2go travel was amazing. He wrote the last part of the cruise well. And showed that Filipinos are friendly adn hospitable even if it isn't their own home. Cool article. It is nice to see everyone smiling in the pictures and videos. I am sure that 2GO Travel's employees pampers their customers well that we can see from their faces smiles of contentment and excitement. You showed a good way to end a trip! Thank you for your articles. I learned a lot from them. This is a nice conclusion to the 2GO Travel Adventures. All 3 parts will surely help increase 2GO's sales. I congratulate the writer of the articles and 2GO! Keep up the good work! It can be seen in the article that the author really enjoyed his adventure with 2GO Travel. That experience lets the readers feel like they would want to experience what that author has gone through. The 2GO Travel Adventure experience is good in a way that it lets their passengers have a break by making them see and go to many beautiful places and meet different people that will make us forget some of the negative vibes we have and be able to face tomorrow with a smile. I am sure that the author did enjoy the travel with 2go cruise ship. I want to try it in summer. The cruise ship did provide an amazing environment for their customers especially the foods they serve. Not only the customers enjoyed but also the employees. And also i think the food is amazingly delicious. I hope that i can ride with this cruise ship on summer with my family. It only shows that Filipinos are really hospitable in heart. It nice to see that in every picture that Filipinos are happy on their trip. When you were going in any place, its not to see to meet any people and with different personalities. This article show that "it's more fun in the Philippines". Not only the Filipinos can experience this kind of cruise ship but also the foreigners. I'm happy that the writer able to show us his different experience around the ship. It's nice to meet new people and encounter new personalities. You'll not only would encounter your fellow bloggers but also young people and adults. It's not on the age of the people who take the cruise ship but the experience that you would never forget. Also, it can be seen that Filipinos are really hospitable in every inch of the Philippines. Whoever we met, whoever we talked, we always acknowledge the presence of anyone though they're bad or good. Also, it's not to see how happy are they in their trip. Thanks writer for the wonderful article. It's not only an article but a wonderful experience that anyone would like to encounter. A very entertaining article, it gives information on the people inside the ship. It really shows the different attitude of the people who serves the ship. It shows that Filipinos are really hospitable in every people. This article is one of example that the writer focus on the people around the ship. Nice article! Its nice to see that 2GO has a nice array of services that leaves its customers feeling happy and at-home. Indeed, the Filipino trademark of being hospitable is evident in this cruise. I do want to try cruising, too, and what better way to try cruising than by going on a cruise of your own country. I hope I'll be able to have a cruising adventure of my own someday. This articles is very sensible and well delivered. I hope you continue inspiring people with your articles. I appreciate the effort of taking pictures and videos of the article writer. Good grammar skills. The writer truly enjoyed the 2Go travel experience. The joy and excitement exudes from the photos, videos and his stories. He was satisfied by the services of the cruise staff. It makes me want to experience 2Go Travel also. I tried 2Go ship in 2013 and it was my first time travelling on a ship. It was a good experience and I will always take 2Go on my travels instead of plane. You will meet new friends while traveling.